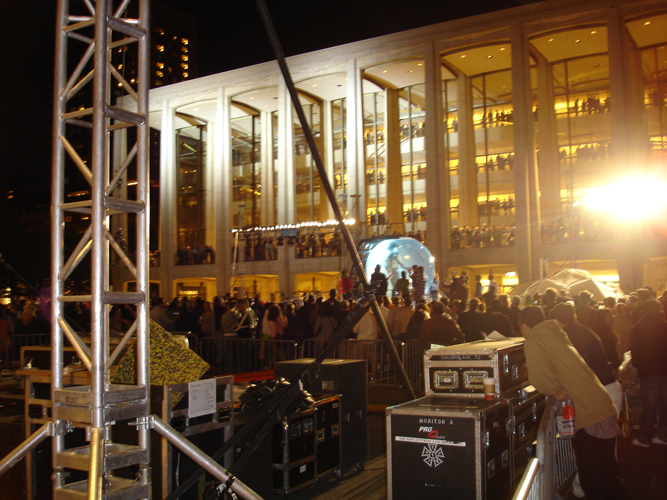 on saturday night, joe and i wandered up to lincoln center to see david blaine in his giant manbowl. almost a week into "drowned alive," his experiment in self-pickling, several hundred people were watching him blow bubbles and make mysterious gestures at foreign tourists (and, let's be honest, a lot of locals). "No one would analogize what David Blaine does to what occurs on our stages," said Reynold Levy, the president of Lincoln Center. "But the emotions he evokes, the feelings he has engendered, are universal. He is doing to New Yorkers what almost no one can. He's stopping them in their tracks. I look at their faces, and I see complete wonder and bewilderment." Ann Sheridan, a Manhattan resident who took in Mr. Blaine's watery world about 10 p.m. on Thursday with several friends, drew comparisons to the public art project by Christo and Jeanne-Claude that swaddled Central Park in sheets of saffron last year. "It's like 'The Gates,' " she said. "Nobody understood what 'The Gates' meant, but everybody went and saw them." i was thinking of christo as we stared at blaine, actually; are blaine's performances public art? can they be compared with, say, performances at the lincoln center (or 'the gates')? i'm not particularly fond of DB (and we fell quite a bit short of "complete wonder" at bubblefest this weekend), but i'm having trouble with a definitive 'no.' peanut gallery?